A corset’s quality depends on multiple factors. In order to ensure the high performance and long durability of our pieces, Rose Sathler – Alta Corseteria counts on the best materials available in the national and overseas market – not to mention the savoir faire, typical of our Atelier. With the aim of pursuing our craving for quality (inherent to its creativity), the brand not only picks the best components but also invests in the development of exclusive raw material for the production of its pieces. 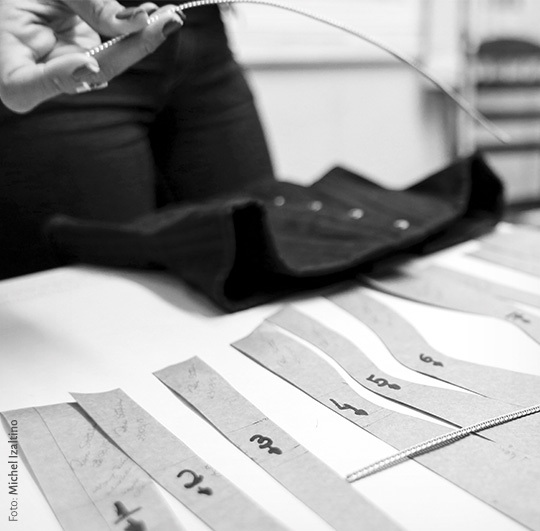 The production of each corset is focused on the artisan’s character. Each new piece counts on the whole team’s absolute dedication pervadingall of its many processes, that are necessarily divided in individual body assessment, modeling, structuring, finishings and checking – that are subdivided in many other slight processes, particular of each design. The goal is to offer each client one unique aesthetic experience. Besides the brand’s patent Design, another easily recognizable trait of our pieces the exclusive Busk developed by designer Rose Sathler. The Busk, a traditional corset clasp created in 1850, has a new and smaller, more delicate, resistant and durable version. Made up of stainless steel, the accessory has a slightly altered shape that alludes to curves – the ultimate symbol of corsetry and femininity.